You don’t have time to clean your pool. Or maybe, you just don’t want to. That’s okay! We have a team of cleaners here who are happy to take that chore off of your hands. Leave the weekly pool cleaning — vacuuming, scooping and chemical additions — to the pros. We will leave your pool sparkling clean and will also take care of any incidental problems that may have popped up along the way. There’s no need to bring in a monthly water sample or balance your own pool either; that’s all included in the service. Let our cleaning team take care of your pool so you can focus on enjoying your summer. Contact us for more information! 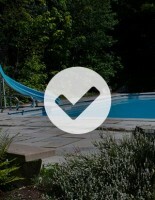 This service is suitable for customers who want a maintenance free pool. Our maintenance program includes a vacuum, cleaning the waterline, backwashing or rinsing of the cartridges, emptying the baskets, brushing, skimming, scooping and a quick strip test for testing and balancing of pool water, plus the addition of the weekly maintenance chemicals. Extra services are performed as required. Our weekly cleaning customers are guaranteed a sparkling clean, healthy swimming pool! Please let us know which week and month you would like your services to commence. Please let us know which week and month you would like your services to conclude. Or state end of season and we will determine when you are ready to close up the pool. Do you have any specific requests or requirements? Placement of items, Covers left on or off etc? Please note that all covers should be left off of the pool for the manufacturers recommended amount of time post shock. If you wish us to recover the pool it will cause damage over time to the cover as well as the cover does have some debris that will settle back into the poo water upon closure. Download this schedule for your weekly pool care to ensure your pool remains in excellent condition.